Successfully Added High Power 30mW Green Laser Pointer Pen (Military Edition) to your Shopping Cart. 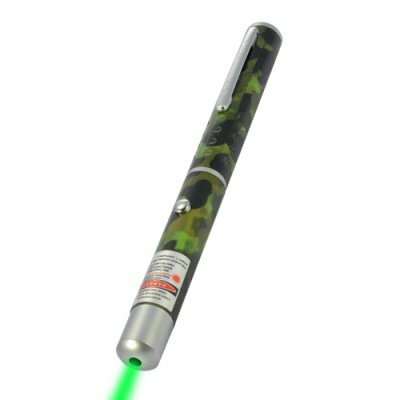 This high Power 30mW Green Laser Pointer Pen features a cool camouflage green design, perfect for presentations, lectures, seminars, projector screens, charts, slides, tour guides and facility inspections. Designed in a compact form factor that resembles a pen, this laser pointer can be carried conveniently anywhere, anytime in your pocket. Constructed using a sturdy, all-metal casing, the pointer both looks and feels professional, while the military design will make your presentations more interesting. If your goal is to deliver the perfect presentation and capture the attention of the audience, this professional presentation gadget effortlessly and clearly highlights key points for everybody in the room. Simple to use, with a click of a button, this useful gadget delivers a consistently strong beam with pinpoint accuracy using green laser optics. This model laser pointer is perfect for students, engineers, doctors, teachers and people who all need one to make their work stand out, or simply just want one for fun. It would also be an ideal gift for someone you know who does a lot of presentations or wants a safe laser gadget to play around with. So order a few of these great laser pointers, use one for yourself and sell the rest on eBay or your local market to cover the cost of your one and the shipping. Proudly brought to you by the leader in China Wholesale Electronics, Chinavasion. The laser is strong enough to reach across any room, and is best to use at night or low light conditions for clear visibility.